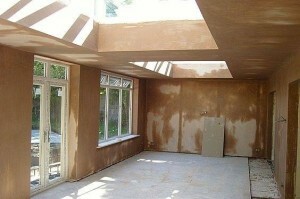 Are you looking for plastering for your walls or ceilings? Then look no further and book an appointment from one of our qualified plasterers today. Dry lining is a substitute plaster that is smoothed onto a background surface such as block work, brickwork or masonry. Leaving these surfaces bare are not an acceptable finish for aesthetic reasons. A plasterboard is fitted to the surface, and the substitute plaster is applied. This method does not use as much water as traditional plaster, therefore lessening the drying time. If you require insulation, this is glued to the plasterboard back before it is fitted. A vapour layer is fitted with or without insulation. Insulation can be fitted into the cavities that are created between the studs of timber or metal. This type of dry lining is known as tacking. When choosing this type of plastering make sure you choose the correct plasterboard. If you have traditional materials, you may prefer Wet plastering It will offer better soundproofing and it will not cause any problems when attaching fixtures to walls. This method of plastering uses gypsum backings or cement renders that is applied to block work. It is simple to apply and will give your walls a durable, smooth finish. The only disadvantage of this is the drying time, but if you want aquality finish, it’s always best to wait. Rendering is different to plastering, because it is applied to external walls for a textured décor or smooth finish. To produce this you have to mix cement, sand and hydrated lime with water and a mortar plasticiser. Two coats of rendering has to be applied to your wall; the first is the scratch coat and the top coat is the second layer. The first coat will have to be left for 24 hours to dry properly. Once this is dry, the second coat can be applied and then ruled to flatten the surface of any little bumps. This can then be painted when it is fully dry. This type of plastering is a surface coat, which adds swirly texture to walls and ceilings in the United Kingdom, since the 1970s. This is not as popular as it was back then, but somehomeowners still like to have this finish. Some do choose to have their artex removed, but it can be messy and difficult. If you would like to remove the artex from your home, a qualified and experienced plaster can do this for you. There are easy techniques that include using a wallpaper stripper to scrape it off the walls and ceilings. Or an artex skim coat can be smoothed over it. When the artex has been removed, it can be finished with sandpaper that is ready for painting and papering. If one of these services is something that you would like to have in your home, get in touch with KP Suspended Ceilings Manchester Ltd today, to book an appointment.